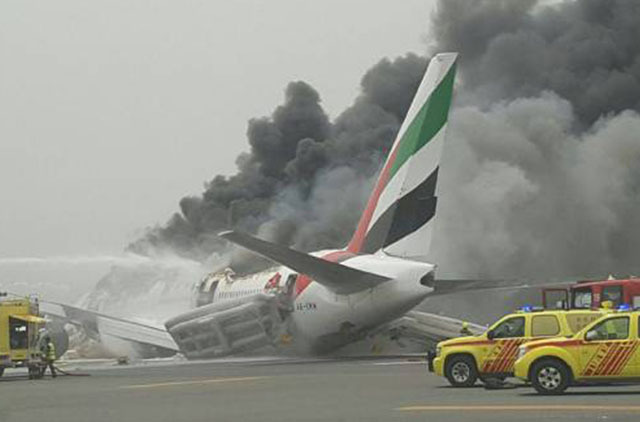 Dubai: The investigation into what caused an Emirates Boeing 777 with 300 people on board to catch fire at Dubai International will take three to five months, according to the UAE’s federal aviation authority. The 282 passengers and 18 crew on board flight EK521 from Thiruvananthapuram in southern India escaped the aircraft before flames gutted the jet on Wednesday. A firefighter died tackling the blaze and there were 13 injuries, including five passengers and one crew member, according to Emirates. A GCAA spokesperson confirmed to Gulf News on Thursday that the investigation would take between three and five months to complete, calling the length of time “normal procedure.” Emirates referred a question on the duration of the investigation to the GCAA. A preliminary report would be issued within one month of the incident, the GCAA said later in a statement. On Thursday, Dubai Airports chief executive Paul Griffiths said the aircraft's cockpit voice recorder and flight data recorder, commonly known as "the black box," had been recovered by the GCAA investigation team. "What we were able to do after the incident happened is allow the accident investigators from the GCAA, and the various specialist teams, to have to access to the site. They were able to go and gather what evidence they needed to very quickly," he said at an evening press conference. A three to five month investigation period “for a crash of this nature,” is routine, according to, Mark Martin, an aviation analyst and founder of Dubai-based Martin Consultancy who said he has worked as a consultant with the GCAA in the past. He said an investigation typically begins with the retrieval of flight data recorder and cockpit voice recorder (CVR), commonly known as the “black boxes”. “And then the plane is put together in a hangar and all its parts are pieced together” to be able to try and establish what happened. The 777 is widely accepted as one of the safest aircrafts ever made, with very few having been involved in incidents where the aircraft was damaged beyond repair. In a note on Wednesday, Martin said that the “hard impact [on] the ground may likely have been as a result of an unstable approach”. According to data released by flight tracking website flightradar24, the 13-year-old Boeing 777-300 came in to landing at a speed of 155 knots (287 kilometres), slightly higher than Boeing’s recommended 149 knots approach speed. The aircraft then increased its speed to 180 knots within seconds whilst continue its descent before coming to a halt. Emirates chairman and chief executive Shaikh Ahmad Bin Saeed Al Maktoum at press conference on Wednesday said that the Australian and Emirati pilots may have tried to abort the initial landing attempt due to wind shear, which is a sudden change in wind direction. But he was unable to comment on the discussions between the cockpit and air traffic control in Dubai leading up to the incident. A passenger who was on board told Gulf News that there was no indication anything was wrong as they were coming into and land. After the flight landed there was “shaking and then a big bump” and “we dropped suddenly”, Indian national G. Jagadeesh told Gulf News. Other media have reported that the pilots told the passengers that there was an issue with the aircraft’s landing gear and that they would be making an emergency landing. The incident is the worst in Emirates’ 31-year history and the first time the airline has had one of its aircraft damaged beyond repair. Emirates has described what took place as an “incident” and an “accident”. The GCAA said the aircraft was making an “emergency landing”. The flight closed Dubai International, the Middle East’s busiest airport, for several hours on Wednesday and reopened later that day with only one of its two runways operational. Emirates said Thursday it expects flight disruptions across its network for the next 36 hours and that 23,000 of its passengers were impacted by the incident. Hundreds of flights were cancelled or delayed on Wednesday and Thursday.